The Sanskrit word Leela means the effortless play between the Sublime and the physical world. A thing of Beauty and Power. It is the Sublime bliss that inspires creation. Leela is all this and more in Indian classical dance, where dance is a personal form of prayer. Where the dancer is virtually inseparable from the dance as the body is trained to become one with the mind and spirit to create the Sublime Bliss we call Rasa. This is the ultimate goal and purpose of art. At Leela we nurture and inspire young dancers to reach these heights in their dance. We strive to create the environment for them to develop discipline, dedication and passion for their art. This is achieved through a holistic education that combines in-depth instruction in the practice of Bharata Natyam with applicable theory. 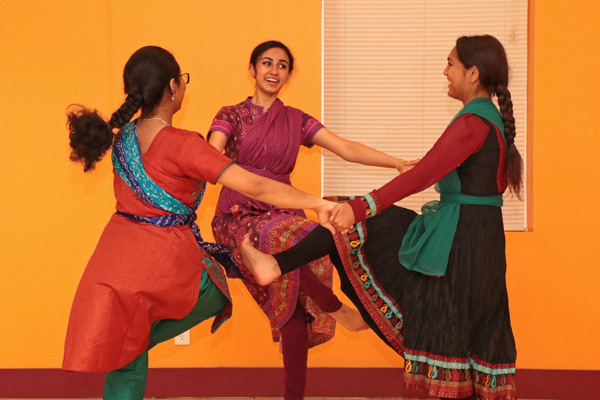 With a well balanced curriculum students advance from learning the rudiments of movements called adavus to simple and complex dance pieces that form the Bharata Natyam repertoire. Dancers are meticulously guided through all areas of dance instruction for them to acquire proper body alignment, posture, coordination, rhythm, balance, strength and flexibility. In addition, opportunities to perform develop self-confidence, poise and self-assurance. At Leela dance is more than a performing art. It is an education. Copyright © 2019 Leela School of Dance, All Rights Reserved.